I’ve been a fan of Dark Dharma for a while now. The house is so well made and it is super creepy (in a good way). If you haven’t ever paid it a visit, now is the time! It’s nearly Halloween so I decided to do a photo there in a spookycute outfit. This was by far the most difficult, hilarious and even fastest photo shoot I’ve ever done in SL. I had to turn my sounds down because every time I was so focused on getting the picture just right… a monster would pop up and a creepy sound would play. I was laughing the whole freakin’ time… I decided eff it, I’m going with silly pics this time around! In other news I wanted to invite everyone to the AvMatch.com Halloween Party this Saturday!! 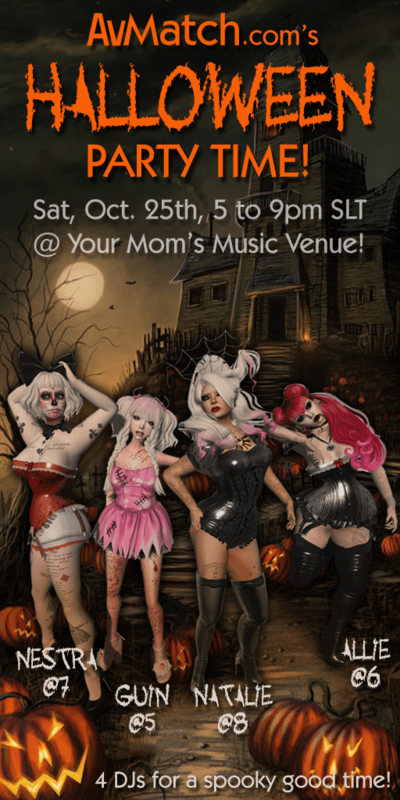 October 25th from 5pm – 9pm SLT. I will be DJing from 5pm SLT – 6pm SLT! Check out the amazing flyer below! (That flyer was OBVIOUSLY not made by me! haha) I’m sure there will be a contest, a chance to win $Ls and possibly AvMatch goodies! The party will be hosted at Your Moms which is a great new club. I DJ there every Saturday so check it out sometime!